Seatcraft's Signature Leather 7000 series continues to delight with The Madera, a seat designed to offer luxury looks, luxury material, and luxury features at a superb value. Everything about this chair is crafted with the utmost care, resulting in an experience that is immediately apparent upon sitting. Even before you sit, the warmly inviting look of The Madera will please the eye. Its casual contemporary style comes in muted brown or black colors that will blend effortlessly in to any decor, abetted by rich wooden accenting on the armrests that lends the chair its sense of naturalistic class. The wooden accents are a popular feature unique to the Madera, which look even better in person than they do in product photos. The overall effect mixes luxury opulence and an unpretentious amiability with ease. The Madera matches its look with its high-grade Leather 7000 material. Leather 7000 is exclusively hand-picked from the top 30% of top grain outer cow hides, for premium looks, texture, and comfort. Leather itself is a renowned in the seating industry for its tough yet pliable texture, ease of maintenance, and plush appearance. The material actually improves in texture, comfort and appearance over time, as it conforms naturally to your body's contours. But Leather 7000 goes further than this, by being carefully buffed and polished to remove any blemishes or textural imperfections, for the smoothest feel possible. Top-grain leather doesn't get any better than this. Leather 7000 is one of the primary highlights to this chair's overall sense of comfort, but it doesn't end there. The Madera's plush, overstuffed headrests and full chaiselounger footrests ensure that your body stays fully supported, even as you sink into its folds. Spacious seating gives one plenty of wiggle room, while a power recline option allows you to stay in any desired position with a simple button-press. You can relax all the way to an almost flat position, yet the Madera can still be seated inches from the wall thanks to its special "wall-hugger" seating. 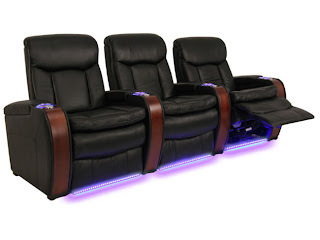 As with the best home theater seats, your body will feel so sumptuously relaxed and yet so fully supported, that you will barely notice you are in a chair! Distracting discomforts like stiff necks and backs will be a thing of the past. Finally, the Madera will make any home theater viewing a matter of full convenience, with everything you need for a great night's entertainment all within arm's reach. LED lighted cupholders will provide a safe place for beverages, while ambient base lighting adds authentic marquee accents that will allow you or any guest to find your way in a darkened room. Free added tray tables allow you to place anything you might need for the evening, from food and remote controls to books and tablets. When you're done, simply place any items in the Madera's spacious in-arm storage compartments. 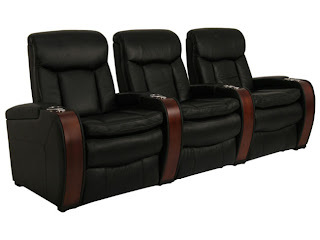 From its sleek wooden accents to the Leather 7000 material, chaiselounger footrests, power recline, tray tables and more, the Madera is everything a home theater chair can be.